There is a brief July 5, 2012 article on the Inverurie Herald website about the flag of arms of the National Trust for Scotland that now flies over Fraser Castle, one of the Trust’s properties. 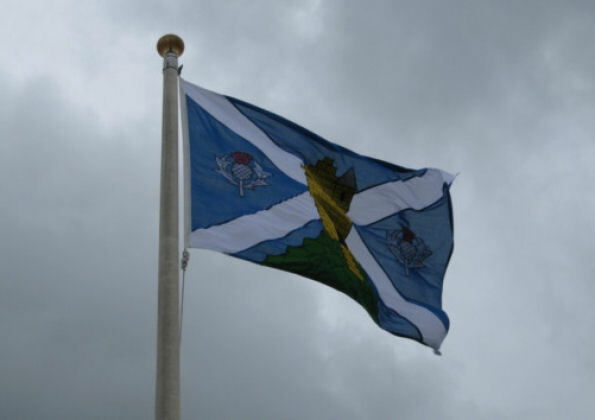 The arms consist of the national flag, Azure a saltire argent, with a castle atop a mount issuant from base, and flanked dexter and sinister (left and right) by two thistles proper. Frankly, I’ll bet that it did take some research; I couldn’t find it on the website of the National Trust, or anywhere else. (Not even Wikipedia, one of my “go to” sources for general information.) All that the NTS website has is their logo, a (modern and up to date, no doubt) castle tower surmounting a roundel with the saltire of the Scottish flag. Anyway, it’s nice to know that the Trust has a coat of arms, even if they don’t use it.